Don’t let the upcoming Challenger SRT Demon tempt you! It may just be a faster, less practical and more expensive Hellcat. 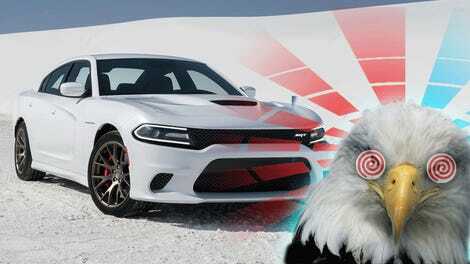 The 707 horsepower monster already has more power than you can handle, and now you can score up to $13,000 off the sticker price. You may recall when I told you specifically not to buy a new Challenger Hellcat. Not that you shouldn’t buy one ever, but the purchase was, in my opinion, unwise at that point in time. However, as predicted, the hype as worn off. Any maniac that had to have the first one probably kept it as a garage queen or sent it into a ditch. Production has increased, and now there are slews of them just sitting on dealer lots with a ton of cash on the hood to make a sale. The best deals are obviously on 2016 leftover models, but when the 2017 model is pretty much exactly the same car, you should take advantage of the massive savings. Most of the discounts are between the $6000 to $10,000 range, with some dealers offering up to $12,000 to $13,000 off. That’s an insane discount for what was already an unprecedented performance bargain. Some folks are even reporting Hellcat lease deals as low as $500 a month with no money down, but you will want to check with your local store on how the details work out for your area. Now the one thing to be aware of, especially with FCA brand dealerships, is that often these advertised prices are stacked with rebates that not everyone will qualify for. So make sure you get a full breakdown of the pricing before you commit to anything. If you’ve had your eye on a Hellcat and were smart enough not to pay way over sticker price when these cars first hit the lots, now is your chance to get some great deals on a monster muscle sedan or coupe—and bank the savings for a few extra sets of tires.